Sendle is one of the new kids on the block in competition for some of Australia Post’s parcel delivery market. As an incentive to try and get your postage dollar, in addition to the regular earn rate of one Velocity point per dollar spent on sending parcels, you and a friend can also earn a bonus of between 100 and 100,000 Velocity points for sending parcels over the next month. Taking a cursory look, this service looks promising, and not just for the Velocity bonus. 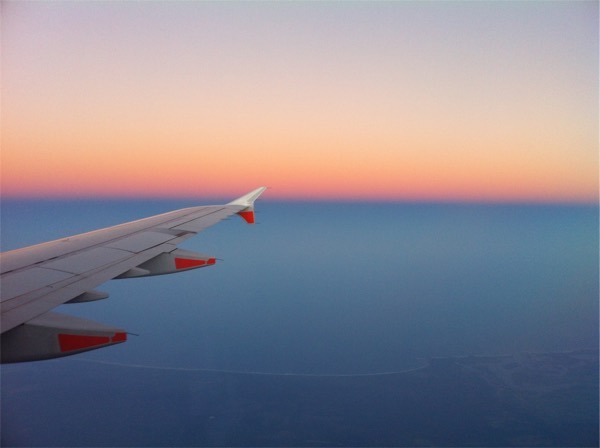 Sendle aims to be a happy medium between Australia Post and a courier company, with the main advantage seeming to be simple, flat pricing, and door-to-door service. Sendle also claim to be Australia’s first 100% carbon-neutral delivery service. Their website also sprukes “Unlimited niceness”, and who can’t do with a bit of that in their day? As an existing customer, you hopefully will have received a unique referral code to share. I would suggest existing (or new customers) wanting to make a referral / take part in the promotion who didn’t receive the email should get in touch with Sendle support and see if they can take part. If you’re looking for a referral, feel free to use ours or if you have your own link, you can post in the comments. 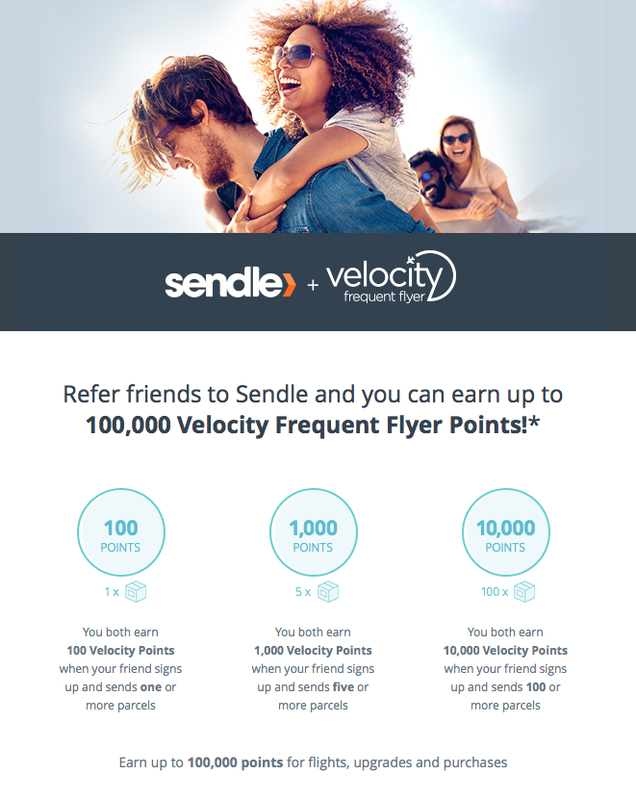 Velocity members earn 1 Velocity Point for every $1 spent with Sendle once the members’ ‘Easy’ or ‘Premium’ Sendle account has been linked to their current Velocity account. Velocity Points will be earned on the dollar value of orders paid for and picked up (‘purchase’). 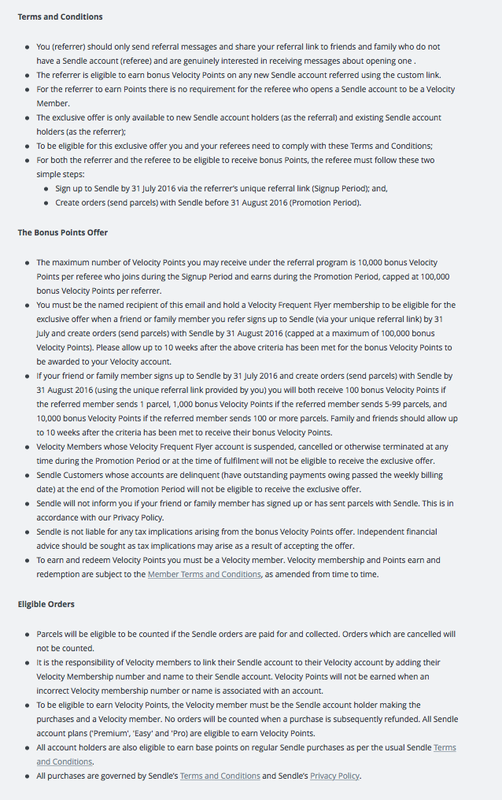 Interestingly, Sendle ‘Pro’ account members are not eligible to earn Velocity Points for any purchases. The terms and conditions on using Sendle to take advantage of the Velocity offer are fairly straightforward. Basically make sure your Velocity account is linked to Sendle to earn the points in the stipulated timeframe. Step-by-step instructions for linking your accounts are on the Sendle support page. The Sendle website is extremely helpful advising on pricing, delivery times, as well as working out what pricing category your parcel falls into. In my experience, this is far more than most couriers offer, without the need to fill in an online form or pick up the phone. If you don’t already have one, you can sign up for a Sendle account here. Where’s the details of how to sign up a friend and link the referral? Hey Nicholas – have a read of this comment, hopefully explains it a bit more. Where’s the 100,000 point earn details?! Great question – I’ve done some more digging and it seems as though the offer was sent out by email to existing members. I thought it was present in my sendle dashboard but now can’t find it. Anyway, the referral code looks like this (this is mine) – https://www.sendle.com/partners/velocity?utm_campaign=RFV7069 – and here’s a screenshot of the offer and of the offer terms. If you’re an existing customer looking to make referrals then I’d suggest contacting Sendle to find your code. If you’re looking for a referral, I’m of course happy if you use mine but feel free to find another too.